New home, new city, new job (for Nicole anyway). And the duffel bag I spent the past year living out of is tucked away under our bed. Yes, we even have our own bed nowadays. We're enjoying Hoboken. Frank Sinatra's hometown is just across the Hudson from Manhattan. Nonetheless, during the seven years we lived in Manhattan, I made the journey to Hoboken twice and Nicole not even once. So despite its proximity to our old haunt, it's very new to us. We've been happy so far. For starters, our housing money goes a lot further. Across the river we never could have afforded the two bedroom, two bath apartment with a private backyard we are renting here. 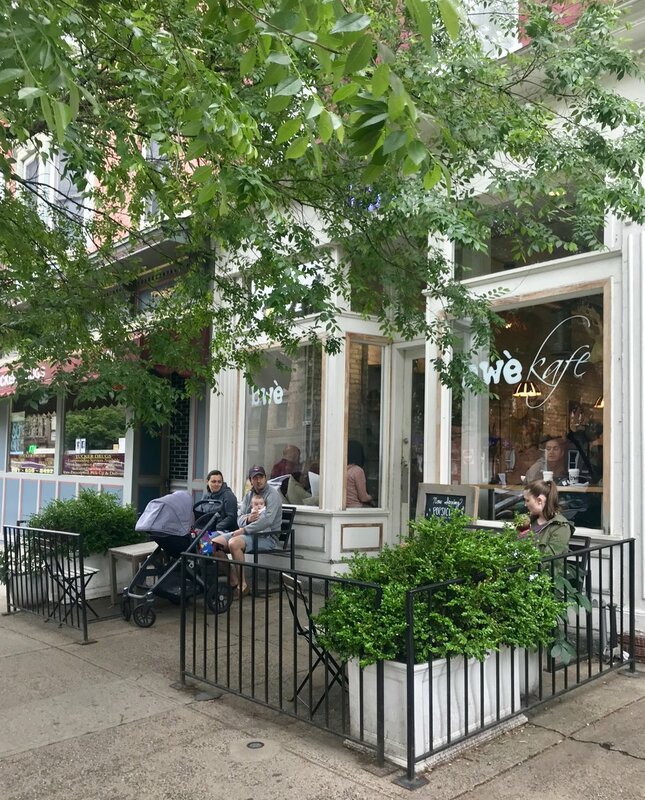 Beyond that, Hoboken is a lot less crowded yet we're still finding there's plenty of nearby places we enjoy like Jeffereson's Coffee, BWE Kafe, and Little City Books. A few days ago, I shot hoops on the basketball courts a block from our apartment; a few hours later, Celtics star Kyrie Irving showed up to shoot around on the same courts. People are still talking about it. We're reluctantly accepting New Jersey. There's something cool about saying you live in Manhattan. Jersey, not quite as much. But we're getting over it (myself quicker than Nicole). We got the move mostly right. Moving out of our Manhattan apartment last year was agonizing. The five flights of stairs from our apartment to street level certainly didn't help. We didn't hire movers but, instead, rented a UHaul truck and hired people from Task Rabbit to help as needed. This meant two tough days of labor for Nicole and I, and between the UHaul truck and the Task Rabbit helpers, we still spent over a thousand dollars. This time around, we hired movers. They got the entire job done in three hours flat and for less money than I would have spent on a UHaul and Task Rabbit'ers. The only problem came after we began sorting through our things. I ended up taking eight full car loads of stuff BACK to ourt storage unit. I actually ran into the moving team a few days later at the storage unit as they were moving someone else's stuff and had to sheepishly explain that Nicole and I overestimated a bit on the extent of our space. It's nice to have more clothes, but most of our stuff I learned to live without. The comment Nicole and I get most from people when we talk about our recent move is, "Isn't it nice to finally get your stuff back?" Truth is, it's been a lot less of a big deal than I thought it would be. Over the past year, I got used to wearing the same clothes more frequently and doing without a lot of creature comforts. So, for the most part, it's good to have an apartment full of things again but not really a game changer.